The 1960 French classic is released on Dual Format Edition by the BFI today. There’s a moment early on in Classe tous risques (1960) that gives fair indication of the muscular swagger with which Claude Sautet directed this decidedly unfussy crime thriller. Sentenced to death in absentia, fugitive Abel Davos (Lino Ventura) prepares to carry out a street robbery in Italy with close companion Raymond Naldi (Stan Krol), after which both will flee the country and make their way to Paris. As Davos nervously holds back on a busy Milanese sidewalk, Naldi edges forward into the road, on the lookout for the two security officers they have targeted to rob. Sautet, filming with cinematographer Ghislain Cloquet, creeps backward as Naldi does forward, with Davos seen all the while in the background of the image. It’s a surprisingly calming moment of simple cinematic poetry, in which one secondary character puts his life on the line for the man who will become, very quickly, a visually and practically isolated protagonist. A series of violent encounters follow: the robbery itself, and then a succession of getaways as the two men look to join Davos’s wife Thérèse (Simone France) and his two young sons Pierrot (Robert Desnoux) and Daniel (Thierry Lavoye) on their way to France. Just as you think the action is about to settle, Davos’ wife and accomplice are both killed in a shootout with border police on the beach at Menton, the French resort on whose beaches they land. Left alone with his two sons, Davos teaches them, with pained dignity, the importance of staying ten paces behind him whenever he’s out in public—and that if he’s caught or confronted by the police, they are to run away. Reaching out for help to a former group of associates led by underworld kingpin Raoul Fagier (Claude Cerval), Davos is met by button-for-hire Eric Stark (Jean-Paul Belmondo), an unexpectedly dependable ally whose attraction to a budding actress named Liliane (Sandra Milo) might get them all into trouble. At just about every turn—and like its central criminal—Classe tous risques oozes no-nonsense professionalism. As noted by both John Patterson and Geoff Andrew in essays included in the booklet that accompanies the BFI’s new DVD/BD release, Sautet directed and co-wrote the film at its star Ventura’s request. And in many ways, this is a two-person show whose taut, rugged economy is the result equally of Sautet’s keen intolerance of narrative excess and Ventura’s palpable gravitas, as a career rogue willing to bash a fella’s skull in to protect his family. (The brutal transit with which the film opens concludes with a loving hug.) With his bent nose and calcified features, the Italian-born actor conveys both a vulnerability and even a touching stubbornness here, heading with noble resignation to a punishingly curt denouement. And then there’s Belmondo, whose presence is an immediately comforting one. Introduced in such a declarative way that you sense he’s the man to aid Ventura all the way (“Je m’appelle Stark. Eric Stark,” he notes with cool self-assurance), Belmondo’s the kind of actor who imbues in his characters an inscrutable edge; as long as he’s in the scene, nought can go wrong. 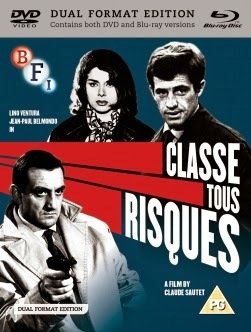 Classe tous risques was released the same year as Belmondo’s breakthrough, Jean-Luc Godard’s À bout de souffle, and while in that film he’s the happy-to-go-lucky, Bogey-admiring, footloose wanderer, here he’s a pro till the end. It’s somehow apt, then, that Classe tous risques fell into relative obscurity alongside its hipper, flashier counterpart. The nouvelle vague had fashion on its side. But this is the brawnier, burlier, bulkier and in some ways brainier film by far.